The poinsettia, an incredibly popular ornamental plant as both a landscape plant in tropical locations and a potted plant in temperate locations, is native to Mexico and Central America. It is, contrary to popular belief in North America, a tree that can be up to four meters tall. A bit big to fit in a pot! Like many euphorbs, poinsettias do incredibly poorly in pots and shed their leaves quite quickly. This can be due to over- or under-watering, but usually is just a case of the plant being incredibly picky, and not being able to tolerate the short periods of sunlight that it does receive during our winters (8-10 hours of sunlight in a very sunny window versus the 12 hours of sunlight it would receive near the equator), and the temperatures that are much too cold (it prefers to grow at temperatures that average 25 degrees Celsius; much warmer than "room temperature" in the average house in North America during the winter!). 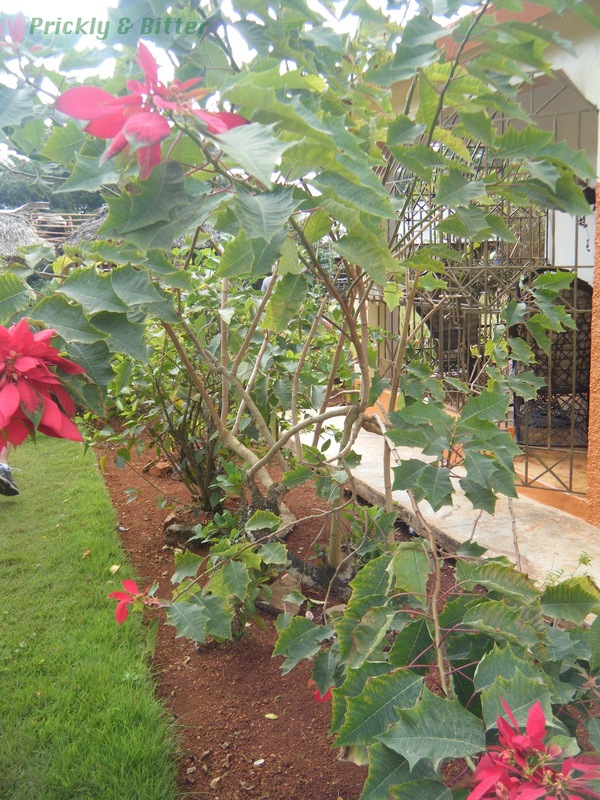 This tree in the Dominican was significantly taller than I was, and while it was rather sparse on the green leaves it had enormous clusters of bright red flower bracts, or modified leaves. Yes, that's right. Poinsettia "flowers" aren't real flowers. Sorry to disappoint you! The true flowers are illustrated in the bottom picture, and even at that they're not fully in bloom yet. The flower buds are the very small greenish pink knobs on the inside of the bracts, and will eventually open into either yellow or white flowers. They are incredibly inconspicuous even when fully open, and do not produce nectar and hence don't attract pollinators (even hummingbirds ignore the bright red bracts). The flowers are, instead, wind pollinated. 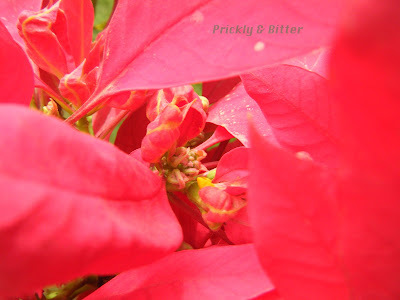 The bracts also aren't always red, contrary to what we picture the typical Christmas poinsettia to be. They can also be orange, yellow, pink, white, green, and a mottled colouration, usually of pink and white together. There is quite a bit of speculation about the toxicity of poinsettias, and parents who have "been there" are usually the first to warn you about how deadly this plant is. Well, let me tell you: all lies. Yes, if a small child ate one of the red bracts (or even a green leaf, or chewed on a stem) they would be quite ill with diarrhea and vomiting if they consume sufficient quantities, and learn never to do that again (albeit the hard way). In an analysis of over 26,000 supposed poinsettia poisonings, none resulted in death and only two required hospitalization (likely a hypersensitivity reaction). 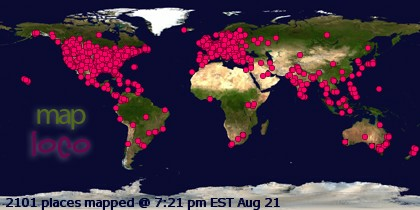 All were as a result of children and accidental ingestion. 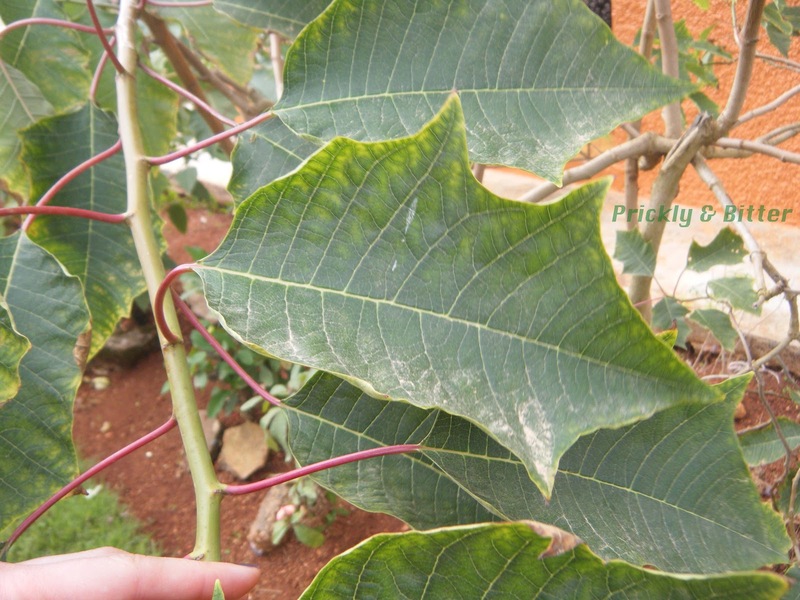 Some studies have looked at just how many leaves one would have to consume to die of the latex produced in the bracts, and the results are overwhelming: a 50 lb child would have to eat 500 bracts to require hospitalization due to risk of death from poisoning. That's a whole lot of poinsettia leaves, and I think the real question there if it ever happened would be how a child could get ahold of 500 bracts and be left alone long enough to consume them all. Sounds more like neglect than accidental poisoning! So will having a poinsettia around Christmas potentially kill a curious child? Absolutely not. You should still ALWAYS educate children about putting foreign plant parts in their mouth, because some houseplants are absolutely lethal enough to children to cause death upon consumption, just not this one. If they play with the bracts too much and release too much sap, the latex will cause skin irritation, rashes, itching, and in some children with hypersensitivity reactions to latex, hives. A word of caution: the jury is still out about this plant's toxicity to cats (it has the same reaction in dogs as it does in humans). There are an over-abundance of cases of cats dying as a result of eating poinsettia leaves, and perhaps some of them are true. But I have my doubts about the majority of them, considering how benign they are to humans (I'm guessing the cat probably got into something else that was in the house that led to the cat's death, but that's just speculation). Better to be safe than sorry; if you have a cat, make sure your poinsettia is out of reach to it (perhaps a tall order...literally) or you are vigilant while your cat is around the plant. The association of the poinsettia to Christmas in the United States and Canada was merely a marketing ploy by a family in California, and a very successful one at that. The plants require a special grafting technique to merge two different species together in order to get the typical bushy plant that you see on store shelves in pots. If left to their own devices, poinsettia plants end up getting rather strange-looking and weedy, as demonstrated in the photos above. Once grafted, they look much more pleasing to the eye. But how to get those red bracts? Because those certainly are not "natural" when grown in North America...or is it? In Central America, because of the 12-hour days, all of the terminal branches have bright red bracts. In order to achieve this, the plants must be exposed to 12 hours of consecutive darkness for two consecutive months, with the other 12 hours being uninhibited sunlight. If any more or any less darkness reaches the leaves, they will stay green (or the plant will just plain old die) and the plant won't be all that attractive. This is the other reason why poinsettias never do well indoors in pots; rarely are they put in rooms that receive total darkness after sunset. I don't know about you, but I like turning on the lights in my living room after dark! The Ecke family business no longer produces poinsettias in California as they had since the early 1900s, but now produces them in the plant's native Mexico. They still serve 70% of the North American market for poinsettias around Christmas. In Mexico, however, this plant has special meaning. The flower bracts radiate outwards like a star, and is said to represent the Star of Bethlehem. Legend also has it that a young girl in the 1600s was too poor to provide a gift to Jesus on his birthday, and instead gathered weeds to lay outside the church. 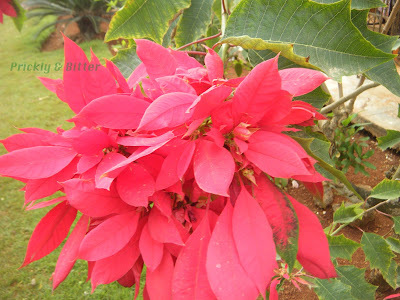 After a few days, poinsettias started to grow and the plants have been incorporated into Christmas celebrations ever since. While not a national plant, it is a very important culturally-significant plant in Mexico. For part 1 of this blog, about the flower bracts of the bougainvillea, please read the blog post HERE.